Posted on October 7, 2015 June 22, 2017 by Kelly J. Do you crave sweets? 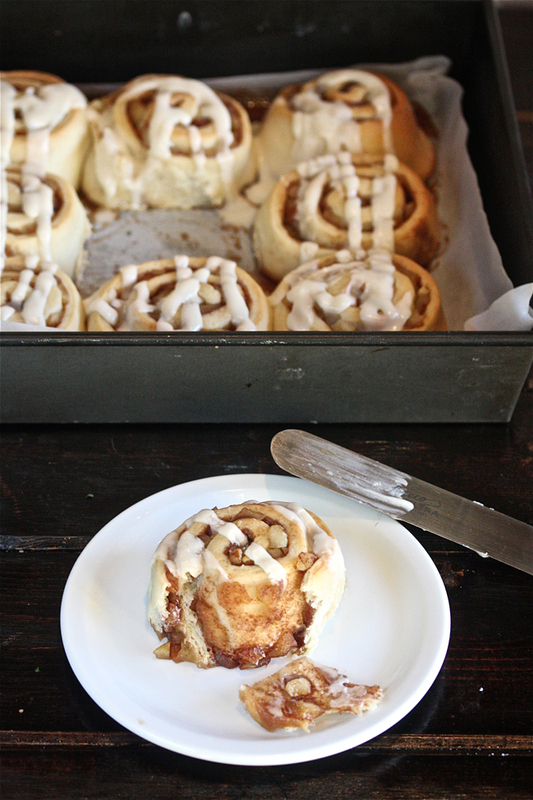 Do you crave warm, gooey stuff for brunch? Do you have a bag of rotting apples in your fridge, molding right this minute? Well, you’re in luck! As fall comes rolling in, bringing warm, fuzzy feelings with it, one of the things you think of is apples. As the leaves turn colors and the air cools down, you just want to cuddle up on the couch with a cup of warm apple cider and a good book. Ohhhh…..that sounds nice….. Anyway, if you need recipes to use up some of those rotting apples, you’ve come to the right place! Here are 10 apple brunch recipes! Enjoy. Skinny Apple Pie Smoothie Yes this is a drink, however, it does make a good light and healthy breakfast! Imagine apple pie in a cup but good for you. Apple Pie Pancakes w/ Vanilla Maple Syrup This looks soooo good. My mouth is like that of Niagara Falls. Just look how fluffy and gooey they look! Wow! Baked Apple Cider Donuts I looooovvve apple cider doughnuts. LOVE them! What’s not to love? 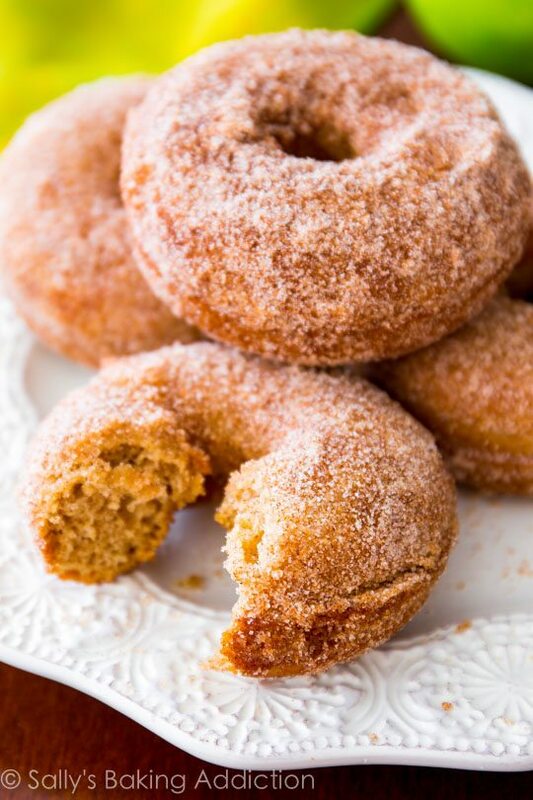 Apple cider, doughnuts….Match made in heaven! Apple Muffins Look how cute these are! Muffins are the ideal breakfast/brunch treats. These would be good with a cup of hot apple cider on a cool fall day. Or fall evening. Or all the time…. Slow Cooker Apple Cinnamon Oatmeal Oatmeal may not sound too exciting. During fall, however, you just seem to crave it more. Add apples and cinnamon and it becomes super delicious! 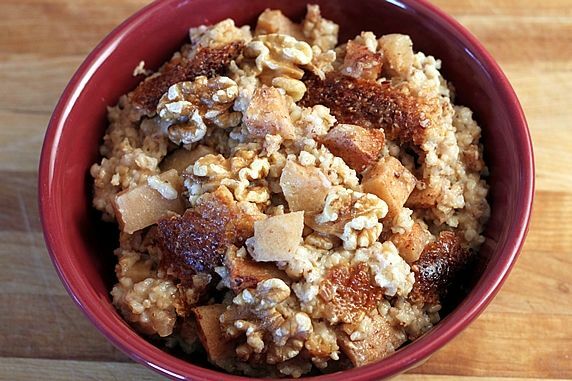 Apple cinnamon oatmeal not only tastes good, but it is also good for you. Apple Cider Fritters Wow! These. Look. Amazing! This is the love-child of an apple fritter and an apple doughnut. This is the fierce ruiner of all diets. The king of goopy, gooey, delicious breakfast/brunch desserts. It makes you wish that Willy Wonka’s Wonkavision (t.v. thingy) was invented. Yumm….. Bite Size Apple Pies Just look. Look at it in gooey splendor. Not only inexpensive to make but also very easy. These are very delicious looking bite sized apple pie. Great for a quick breakfast, an appetizer, or just an after school snack. Apple Pie Cinnamon Rolls Apple. Pie. Cinnamon. Rolls. Enough said. That’s it! What did you think? It’s not over though. The fall cravings have not been satisfied… yet. Up next, pumpkin drinks! Yay!